Click this coin-size button to find your phone, order a pizza, water the lawn, send an SOS, and lots more. You could use this slightly magical, satisfyingly squishy silicone button to turn the music down or the lights off. But that barely scratches the surface of its possibilities. Need to find your phone, and fast? Press the button. Call a cab while stuffing your suitcase? Press the button. Sprinkle your parched garden from work? Press the button. 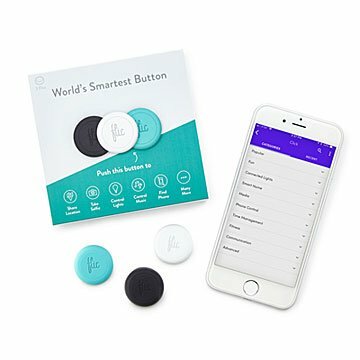 Just assign each button (choose one or a set of three) up to three tasks with the easy-to-use app, and connect to your phone's Bluetooth® (make sure it's in a 150-foot range). Slip one into your pocket or purse; it also comes with a sticky back that attaches it to surfaces—kitchen counter, bedroom nightstand, car dashboard, you name it—and a clip to attach to clothing or bags. It works with a huge and ever-growing list of apps and smart devices, and the more you use it, the more uses you'll think up: Take a selfie, answer a call while you drive, lock your front door from work, send a preset SOS with your GPS location. Kids, elderly people, and anyone who has to walk through lonely places at night, can clip one on as a safety wearable. Compatible with: Android 4.4+, iOS 9+ and macOS Sierra. Replaceable battery lasts up to 18 months. Designed in Sweden. Made in China. Weather-resistant. Up to 2 years of battery life. Gonna pick up a couple more!